How are members of the same group of animals similar and different from each other? Learning to classify living things is an important early-elementary science skill. Young students engage in up-close examinations of crabs, fish, turtles and mollusks. They use their senses of sight and touch to describe similarities and differences in shape, texture, color and more. There’s nothing like live animals to spark inquiry in young scientists! 60 minutes. Every animal changes during the course of its life, but some more than others. Students make discoveries about life cycles by examining live animals and the shells, cocoons and other artifacts they leave behind as they grow. In this hands-on experience, students are introduced to different types of animals and classify and sequence their life-cycle patterns. They also learn key words related to life cycles, including egg, larva, adult and metamorphosis. 45 minutes. Traveling Teacher: $170 for first or simultaneous; $120 for second & additional sequential. Additional travel fees may apply. One hour each. Please note: from April through June, Gallery Explorations are offered only before 10 a.m. and after 1 p.m.
There’s no better way for students to learn about the relationship between structure and function than through close-up observations of live animals. Students examine such animals as crabs, sea stars, snails and turtles in considering how every animal’s body is adapted to the things it needs to accomplish in order to survive. (NOTE: horseshoe crabs replace turtles in the Travel presentation.) This program teaches students to look at even unfamiliar animals and draw well-reasoned conclusions about their lifestyles. 45 minutes. Traveling Teacher: $180 for first or simultaneous; $130 for second & additional sequential. Additional travel fees may apply. There’s a beach in Hawaii called Turtle Town where people come from all over the world to view sea turtles up close. But your students don’t need to travel thousands of miles for face-to-face encounters with turtles. Students compare turtles of land and sea to discover how the creatures are adapted to their terrestrial and aquatic lifestyles. They examine the look and feel of turtle shells, and, best of all, meet and touch a live terrapin. 45 minutes. Touching a live shark is a memorable experience. But that’s just one element of this exciting program. Students start off examining shark teeth and jaws, feel the sandpapery texture of shark skin, and learn how superb adaptations have allowed sharks to survive for millions of years. 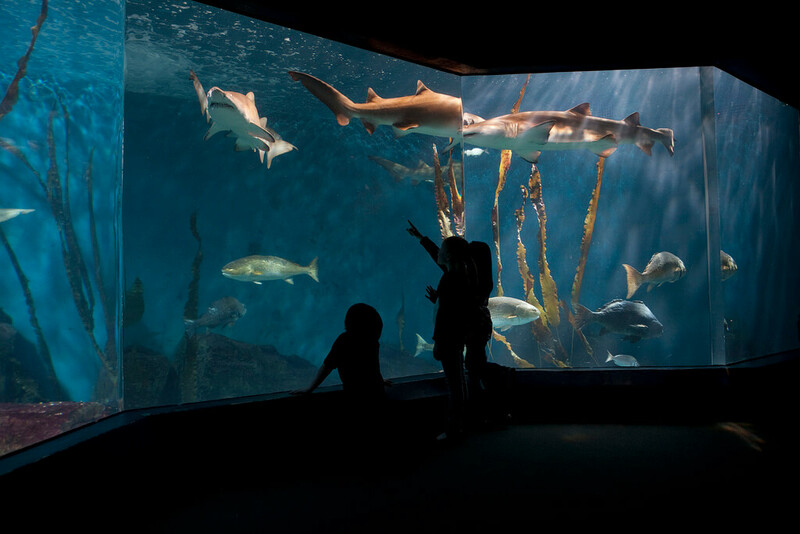 Then, your safari guide will lead students to the Aquarium’s Ocean Beyond the Sound exhibit for a close look at the 7-foot sand tiger sharks. The final stop is our Shark and Ray Touch Pool to safely touch small sharks and a variety of rays (cousins of sharks). One hour. Aquatic plants and seaweeds provide a fantastic opportunity for comparison of each other and to the plants that live in terrestrial environments. Students will observe, feel and draw samples of a variety of these organisms, focusing on the structures they share and those that differ depending on the challenges of life on land and in the water. Finally, students will have the opportunity to learn about human uses for aquatic plants and seaweeds and to examine a variety of products made from them. 45 minutes. Offered only April - June. Imagine living in a place that gets flooded every day! That’s the challenge faced by the amazing and resilient animals of Long Island Sound’s intertidal zone. Students read tide charts and learn how the moon influences the rise and fall of the tides. They meet and touch different kinds of crabs, mollusks and gastropods, use an age-appropriate field guide to identify them, and employ their observation skills to explain how these animals are adapted to the daily and seasonal changes in their environment. One hour. Traveling Teacher: $185 for first or simultaneous; $135 for second & additional sequential. Additional travel fees may apply. Among the most amazing and alien life forms on Earth, squid are endlessly fascinating. Students examine real squid specimens to locate and identify the body structures the creatures use for feeding, moving and protecting themselves. They use tweezers and hand lenses to find a squid’s ink sac, siphon, arms and tentacles, and also compare a squid’s adaptations to those of fish and jellies. One hour. Study cruise programs out onto Long Island Sound are available by charter for Grades 3 & up. The cruise programming for 3rd-graders is grouped with that for Grades 4 & 5. Click Here to Learn More. Explore the marine life at a local beach! Learn more. Need financial assistance? Download the Group Financial-aid Form and either email it to reservations@maritimeaquarium.org or mail to: The Maritime Aquarium, 10 North Water Street, Norwalk, CT 06854; or fax it to: (203) 852-8892.